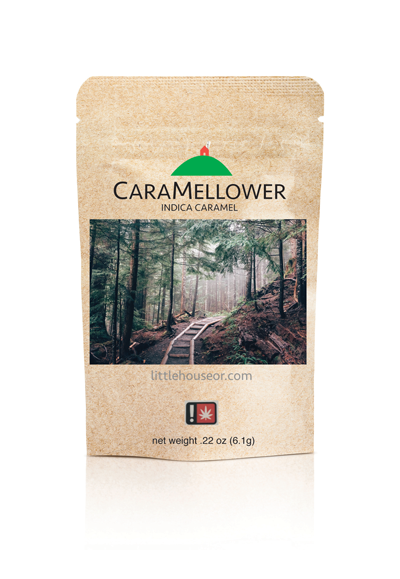 One CARAMELLOWER (infused caramel) contains 10 mg of THC. One jar of our LEMMEND (infused Lemon Curd) contains 45 mg of THC. One serving size is 1 TBSP, and each serving size contains 5 mg of THC. One jar of our CYOC Olive Oil contains 50 mg of THC in the entire bottle. One serving size is 1 TBSP, and each serving size contains 5 mg of THC. One jar of our CYOC Ghee Butter contains 45 mg of THC in the entire bottle. One serving size is 1 TBSP, and each serving size contains 5 mg of THC. Check out the Locations page to find your nearest dispensary! To what temperature can your products be used before the potency declines? THC breaks down at 314 F and works best in recipes cooked under 310 degrees Fahrenheit. For baking however, the internal temperature of your item takes longer to rise and thus is less likely to lose potency. We source our cannabis from Flying Walrus Farms. Flying Walrus is a veteran operated outdoor grow located in Kerby Oregon. Sun grown and all organic, Flying Walrus is located in Josephine county, the best microclimate for cannabis cultivation in the world. We start with organic, sun-grown cannabis and use a proprietary process to remove the majority of plant wax, chlorophyl and any residual detritus. This reduces the 'ganja' flavor, leaving a mild flavor and a cleaner taste. After washing, we infuse our oils the old fashioned way, in a hot water bath. After simmering for several hours at the optimal temperature, we strain, wash and chill. After testing for potency we calculate the amount required for the proper dose and include the canna butter into your favorite LH recipes! We use Bitterman Salt. We are a fan because they are local, sustainable, and value artisanal, craft production. In their own words "Our salts are profoundly rooted in the diverse culinary traditions of the artisans that make them - making our salt the ultimate quality, sustainable, local ingredient." Step 1: email sales@littlehousefoods.com with your METRC number and business name to request an online ordering account and we'll create one for you. Step 2: you will receive an email from us with your username and a temporary password. Step 3: go to littlehousefoods.com/my-account (or click on the user icon at the top of the page) and order anytime. What is Little House's OLCC License Number? What is Little House's METRC Number? To request Little House's METRC number, contact us here. Please write "Requesting METRC Number" in your message. What are Little House's Wholesale Payment Terms? You can order through our sales representatives by sending us your METRC number and then logging onto our online ordering system. Upon receiving your order, we will send you a digital invoice for the total charges plus shipping. We do not ordinarily supply non-infused product samples free of charge. However, please contact your Little House sales representative for more details. Wholesale discounted prices are available to customers that will be reselling our products to the consumer through an established retail store or web site. Please provide a copy of your resale license, or State Tax ID to verify eligibility. All prices are listed in US dollars. All authorized retailers will receive 50% off the MSRP, shipping is gratis. Prices are subject to change without notice. Typically, we ship orders within 1-3 business days. If you have a rush order please let us know and we will exert extra effort to try to get your order out sooner. We try to have everything in stock. However, there may be unavoidable outages. We will either hold your order if we expect to have back in stock within a few days, or we will send your order without the items, with the expectation that you will order the out-of-stock items on your next order. We will note on your packing slip any items that you ordered that were out of stock. Any changes or cancellation to orders must be sent to Little House Foods within 24 hours of order. Please inspect all shipments immediately upon arrival. Please contact Little House Foods within 3 days of receipt of damaged or defective shipments. Returned merchandise will be replaced with new merchandise. Returned merchandise will not be accepted if it is held for more than 15 days after receipt or if any evidence of tampering is found.